Negating one major advantage previously held by Redbox kiosks, Blockbuster Express now allows you to rent a title on its website and pick the disc up by 9 p.m. the following day. The process is simple and very similar to the one used on www.redbox.com, allowing you to browse the availability of titles at a local kiosk and reserve your disc for pickup. 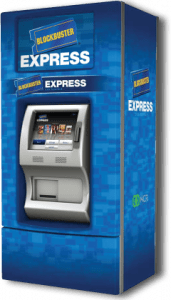 With an advantage in new release titles over Redbox and Netflix, and with major expansion plans in place, NCR’s Blockbuster Express kiosks are becoming a more attractive option for renters. A ZIP code search revealed two well-stocked BB Express kiosks within twenty miles of my house—not exactly the convenience or saturation that Redbox has achieved, but an improvement from even a few months ago. Is there a BB Express kiosk near where you live, Insiders? If so, have you or do you plan to use it, especially now that discs can be reserved online? Tell us what you think in the comments. I remember seeing a Blue Box in a Wal-Mart where I used to live back in Indianapolis, IN. However, where I live now, I haven’t seen any. I have been to many major supermarkets, Including Wal-Mart, Publix, Windixie, Sams Club, Target, mall’s and what not. Nothing, not a single Blue Box. I probably missed one but it doesn’t seem worth the hassle to find one just to avoid a wait. Still don’t understand why BB isn’t susceptible to the delay. BBI express is susceptible to the delay but their small size helps them. Their work around is small right now. Since the vast majority of Redbox rentals are walk up (as opposed to internet reserved), Redbox’s high penetration of convenient food retailers is still a huge advantage over BBI express. In addition those that are internet savvy tend to reserve online and be prolific users of free codes. These customers are likely to jump ship to BBI express first. The other poster here is a perfect example. This in effect will send some of the most aggressive users (read less profitable) to BBI express. Very similar to the type of customers BBI’s by the mail service received from Netflix when they offered the ‘same’ service at a lower price. Netflix in effect sent them a big set of customers that needed throttling immediately. Of course Redbox would be better off with no competition in the space but BBI express is a still a baby with lots to learn. I do not believe BBI Express has to do a workaround at the moment. Unless your studio friends are blind buying DVDs from BBI will last a nano second. Definitely agree with you there, This code shortage thing has me skimming for BBx’s now. Yeah I have looked online but that has only confirmed that the nearest one is too far away to consider. So -in theory- if BB was to get large would they encounter the same delay issues that RB and NF? That BB mail service was a fail with a capital “F”. But their traffic has increased due to code matters and online reserves and such. YES we now have 2 blockbuster express in the area!!! brand new! you know the ones that redbox is willing to wait 30 days for!!! yep, seems like redbox is getting the SCREW and they are bending over for it! hey i havent paid for a movie in the last 300 ive seen except the theaters. for me. give me a stupid box (unmanned) and a market fight and ill take it anyday. good luck to you redbox. bad news, NO bluray anywhere yet! But im ready, got the drive, software, and disk space to handle 40 blurays at a time. Now that’s what I’m talkin about, This guy is ready to rock! TB drives FTW! “hey i havent paid for a movie in the last 300 ive seen except the theaters. Interesting to note that yesterday I checked Blockbuster Express site and saw that the nearest BBExpress was around 8 miles from me at a Sheetz convenient/gas station store. Sooooooooooooooo, I emailed the main Sheetz headquarter site and requested a BBExpress be put in my local Sheetz that is one mile up the road from me. This morning I received an email from Sheetz main headquarters that they will put one in my local Sheetz by April! I like Redbox, but the way I see it competition is always good for the rental customer! Funny. Gas stations are ok but not ideal for movie rentals. If you are getting gas you want in and out fast. The gas station needs to keep lanes open for gas buyers. Is this a self serve station? This is the type of distribution partner that BBI express will be able to attract. Agree, gas stations aren’t the ideal movie rental place. However, since the closest BBExpress I found was 8 miles away at a Sheetz , I decided since I knew Sheetz was already agreeable to having a BBExpress at one of their locations I would try to get Sheetz headquarters to put one in at my local Sheetz. I also mentioned in my email to Sheetz that my local Hollywood Video that was behind my local Sheetz just closed which would probably give more business to BBExpress at my local Sheetz–I’m always thinking of an angle to get a desired result:-). Anyway, my Sheetz is a self serve BUT it is a large Sheetz with around 6 or 7 parking spaces on each side for those using the convenient store instead of just getting gas. I’m thinking the BBExpress will be put on one of these sides of the building. Say it ain’t so RB! You can’t abandon Redbox so heartlessly like this. I’m not ‘abandoning’ Redbox at all! I, like the majority of rental customers do not have any agenda except to get the most for our limited budgets. I have worked for the same company for the past 12 years and this is the first year the company I work for can’t afford to give us employees a raise–plus our health insurance premiums were raised. Therefore, I think I speak for most normal rental ‘customers’ when I say times/the economy is tough right now and any way we can save money, or at least stay within the same low rental price, we will look into those avenues. You said once you have no agenda but that you are in the movie industry, and your opinions seem to have favored whatever business decisions would get more money in the movie/studios pockets (though you’ve often seemed to disguise those opinions as truly caring about Redbox’s survival as a business model???) I, like many on this site, am just an everyday customer who enjoys movies but needs to be on a budget and am one of the ‘god bless them’ peons that Warner B. president refers to who will have to wait the 28 day delay to keep within my budget to afford new releases at a low rental price. However, just like McDonalds was the first to get a dollar menu, but then so did Burger King, Wendys, etc. get a dollar menu, I now go to various/all these places with dollar menus to eat once in awhile. It is not a loyalty to a specific brand, it is a means for me to stay within a budget and still enjoy and afford certain things. When BBExpress opens kiosks near me and if for the same low $1 rental, then I will use BOTH Redbox and BBExpress (plus still my library), just like I now go to various fast food places, not just McDonalds, to use their dollar menu. :-) Also, I agree that I can’t see how BBExpress will be able to have new releases on day one and still be able to only charge $1 rental price for long. Even if BBExpress agrees to the 28 day delay, keeps a $1 rental price, but carries a couple different movies than Redbox, then I’ll still use BBExpress for those different movies if I want to watch those movies…….Much like how many customers now have Netflix plus also use Redbox. Again, it’s not a loyalty to a certain brand, it’s a means of staying within a budget and still being able to afford certain things you enjoy. I don’t think the studios understand this fact about customers, especially during this tough economy. I’m just funning with ya RB. You sound like a yinzer. Is the Norman Center Blockbuster in Bethel Park closing? Before I went to jail, I would rent from that location :-). I’m going to accept your ‘yinzer’ comment as a term of endearment; otherwise, I’d have to have my buddies in your jail teach you a lesson about respect for us yinzers in Pittsburgh! This yinzer has only been to the Bethel Park area a couple times so can’t say if the BB there has closed. However, if I ever am at the BB in Bethel Park, I’ll tell them their buddy Bernie says Hi! It’s starman15317 [note the 15317 zip code] who would be the “yinzer” to check on the Norman Center Blockbuster closing. Oh, okay Starman Madoff!!! Fellow Yinzer!!! I’m in Dayton OH, currently still the home of NCR. A search using my zip code lists a BB kiosk *inside* NCR’s building/campus. It’s noted as “not open to public”. almost 7 within a 5 mile radius ( Buy For Less Grocery Chain). that isn’t bad. But I’ll stick with Redbox for the moment…. what if BB has a movie that Redbox does not care like whip it? We’ve got about equal competition between the number of Reds vs Blues here in my area. Something like 15 to 17 boxes each within 7 miles of home. All locations are viable as they are on regular work route and shopping route. SO…with Blue having the movies I want WHEN I want, I’m afraid I’ll be using Blue now that they have online reservations and rental. Free or not free, that’s not the pull for me. For me it’s about selection as far as I’m concerned. Sorry Red. It would be nice if NCR got off the decaf and started installing boxes in more areas. Besides online reservations BB Express also allows you to enter a coupon code when reserving online, which Redbox does not offer. You can’t beat reserving a movie in advance and getting a possible FREE rental too! After MovieCube kiosk (same $1 DVD rental as Redbox) disappeared from Publix Supermarkets not long ago I received an email from BB Express that they were now located in Publix.Plus the Redbox kiosk that I normally frequent is no longer there since Albertson’s Supermarket in my area had closed.Yes I have used BB Express several times since they allow online renting PLUS accept promo codes which Redbox doesn’t.So far BB Express doesn’t have a 28 day waiting period for new releases like Redbox and now Netflix have agreed to.